Many Americans have lost confidence in their country's "energy security" over the past several years. Because the United States is a net oil importer, and a substantial one at that, concerns about energy security naturally raise foreign policy questions. Some foreign policy analysts fear that dwindling global oil reserves are increasingly concentrated in politically unstable regions, and they call for increased U.S. efforts to stabilize -- or, alternatively, democratize -- the politically tumultuous oil-producing regions. Others allege that China is pursuing a strategy to "lock up" the world's remaining oil supplies through long-term purchase agreements and aggressive diplomacy, so they counsel that the United States outmaneuver Beijing in the "geopolitics of oil." Finally, many analysts suggest that even the "normal" political disruptions that occasionally occur in oil-producing regions (e.g., occasional wars and revolutions) hurt Americans by disrupting supply and creating price spikes. U.S. military forces, those analysts claim, are needed to enhance peace and stability in crucial oil-producing regions, particularly the Persian Gulf. Each of those fears about oil supplies is exaggerated, and none should be a focus of U.S. foreign or military policy. 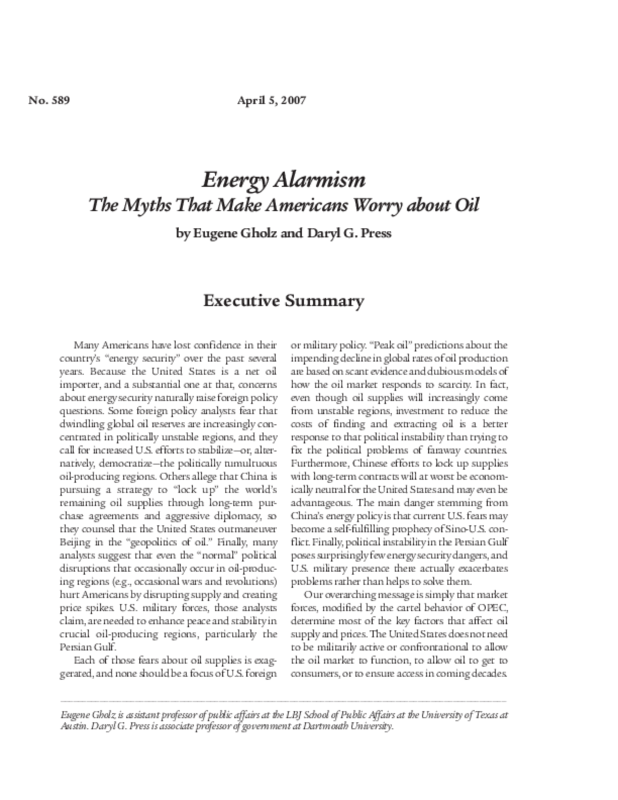 "Peak oil" predictions about the impending decline in global rates of oil production are based on scant evidence and dubious models of how the oil market responds to scarcity. In fact, even though oil supplies will increasingly come from unstable regions, investment to reduce the costs of finding and extracting oil is a better response to that political instability than trying to fix the political problems of faraway countries. Furthermore, Chinese efforts to lock up supplies with long-term contracts will at worst be economically neutral for the United States and may even be advantageous. The main danger stemming from China's energy policy is that current U.S. fears may become a self-fulfilling prophecy of Sino-U.S. conflict. Finally, political instability in the Persian Gulf poses surprisingly few energy security dangers, and U.S. military presence there actually exacerbates problems rather than helps to solve them. Our overarching message is simply that market forces, modified by the cartel behavior of OPEC, determine most of the key factors that affect oil supply and prices. The United States does not need to be militarily active or confrontational to allow the oil market to function, to allow oil to get to consumers, or to ensure access in coming decades.